This pretty little pole-barn is big on efficiency and versatility. There's a 20'x24' open center area for storage and grooming and a 16'x24' Loft. You can build it with 4 or 6 stalls or build the 4-stall barn now and add the extra stalls later. 4-Stall Barn Floor Area: 960 Sq. Ft., 6-Stall Barn Floor Area: 1,160 Sq. Ft., Loft Area: 420 Sq. 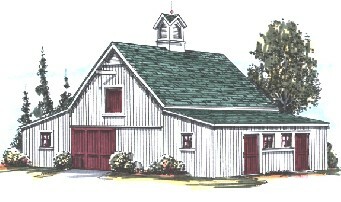 Ft., Ridge Height: 20'-4"
Like this barn plan? Buy the complete set now for just $45.00! Comments? Suggestions? Please tell us! The information contained on this site is intended for general informational and educational purposes only. Visitors should not rely solely upon any information contained on this site for their specific or particular needs.